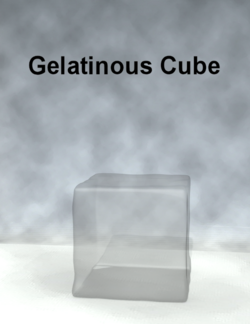 The gelatinous cube is one of the scavengers not uncommon in dungeons. Its cubic form is ideal for cleaning all living organisms, as well as carrion, from the floor and walls of underground passageways. Certain very large cubes are taller so as to be able to garner mosses and the like from ceilings as well. This figure is as posable as something that isn't actually posable can be. That is, to say, it isn't. But it's in a figure! This page was last edited on 26 March 2019, at 20:24.